One of the most coveted of all designs in American flag collecting is the Great Star pattern, also known as the Grand Luminary pattern. The pattern was proposed by Captain Samuel Reid, circa 1815-1820, as a way to arrange the stars so the pattern would be easier to identify at sea, and so that the same basic design could be maintained as the number of stars grew. Reid's proposal was rejected by President Monroe, but regardless of the pattern not being officially adopted, the practice of making flags with stars arranged in this fashion is seen on some flags beginning in the 1820's. 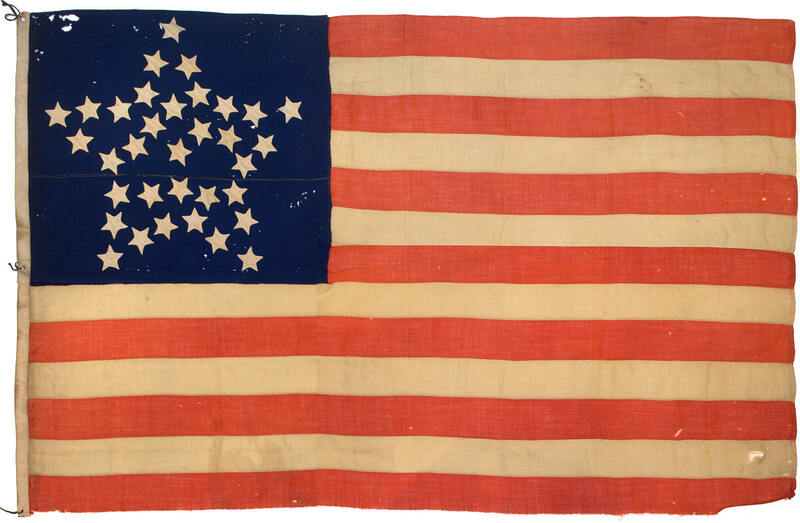 A small peak in the production of Great Star flags took place with the 26 star count for Michigan statehood, circa 1837-1845 (see IAS-00168) and the pattern also became very popular during the American Civil War, after which it all but disappeared from use. The Civil War era Great Stars are among the most sought after types of early American flags, and this beautiful flag, entirely original and unaltered, and dating to the opening two years of the Civil War, is a gem among known examples. Like another Great Star in the Rare Flags collection, IAS-00091, this Great Star is oriented so that it stands straight and proud on the canton when the flag is displayed horizontally. The stars of the flag, made of cotton, are double-appliqué, being hand sewn, back-to-back, onto both sides of the canton. The wool of the canton is made of a heavy twill wool weave, the same type that would have been used for blankets or uniforms. The wool stripes of the flag are machine stitched and the grommets on the cotton hoist of the flag are whip stitched by hand. It remains in a remarkable state of preservation, with rich, deep colors and very little mothing or wear. Overall it is a rare, unique example of the type and a wonderful and important early Civil War period flag.